Our Little Miracles: 3 Months Old! 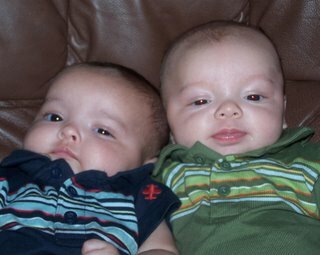 Last week Hayden & Carson turned 3 months old. Time flies by so quickly!! We have not been to the doctor in a while, so we don't really know how much they weigh. But, on Saturday, I decided to weigh them myself. From what I can tell, Hayden is about 14 1/2 pounds now (and about 25 inches), and Carson is about 12 1/2 pounds (about 23 inches). They are getting to be so much fun! They will smile at you and coo. They especially like saying "I goo," and sometimes it sounds like "I'm cooool." They are beginning to grasp things on purpose (I think), instead of it just being a reflex. Also, they will stand in your lap (with support of course) and are holding their heads more steadily each day. Before we know it, they will be sitting up and starting to walk! They are so adorable and I think it is funny how the one looks like you and the other like Phillip.